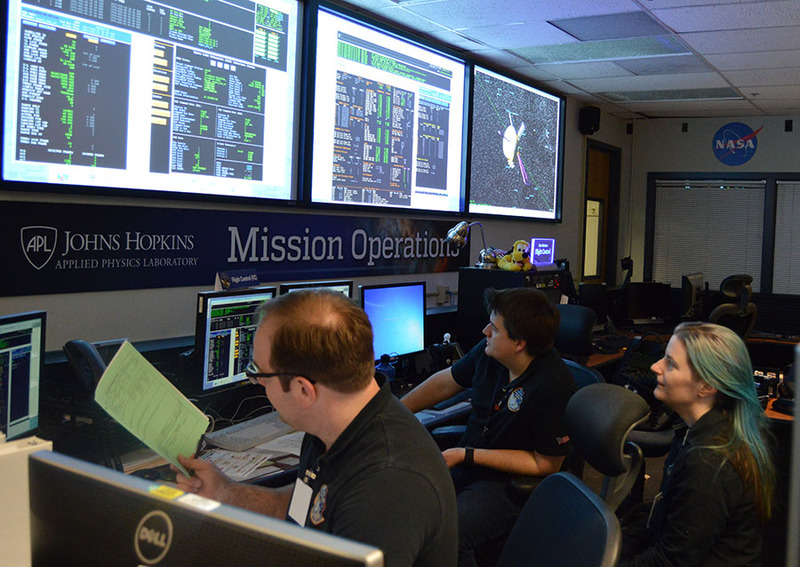 In the New Horizons Mission Operations Center at the Johns Hopkins Applied Physics Laboratory in Laurel, Maryland, flight controllers (from left) George Lawrence, Josh Albers and Katie Bechtold monitor data from the spacecraft following a successful trajectory correction maneuver on Feb. 1. NASA's New Horizons spacecraft completed a short propulsive maneuver Wednesday to refine its track toward a New Year's Day 2019 flyby past 2014 MU69, a Kuiper Belt object (KBO) some 4 billion miles (6.4 billion kilometers) from Earth. Telemetry confirming that the engine burn went as planned reached the New Horizons mission operations center at the Johns Hopkins Applied Physics Laboratory (APL), via NASA's Deep Space Network stations in Goldstone, California and Canberra, Australia, shortly after 1:15 p.m. EST. The radio signals carrying the data traveled over 3.5 billion miles (5.6 billion kilometers) and took more than five hours to reach Earth at the speed of light. Operating by timed commands stored on its computer, New Horizons fired its thrusters for just 44 seconds, adjusting its velocity by about 44 centimeters per second, or a little less than one mile per hour. It was the first trajectory maneuver since the team conducted a set of four maneuvers in the fall of 2015 that put the spacecraft on a course for its rendezvous with MU69 on Jan. 1, 2019. "One mile per hour may not sound like much," said mission Principal Investigator Alan Stern, of the Southwest Research Institute in Boulder, Colorado, "but over the next 23 months, as we approach MU69, that maneuver will add up to an aim point refinement of almost six thousand miles (10,000 kilometers)." New Horizons Mission Design Lead Yanping Guo, of APL, said Wednesday's burn adjusts for what the team has learned since 2015 from new Hubble Space Telescope measurements of MU69's orbit, as well as the spacecraft's own location. After the burn the spacecraft transitioned out of a so-called "three-axis stabilized mode," the operating mode that allowed New Horizons to make new telescopic observations of six KBOs over the past week. These science observations will reveal new information on the shapes, surface properties and satellite systems of these objects, in ways that can't be done from Earth. Images from these studies will be transmitted home in the coming weeks. What's Next for New Horizons? 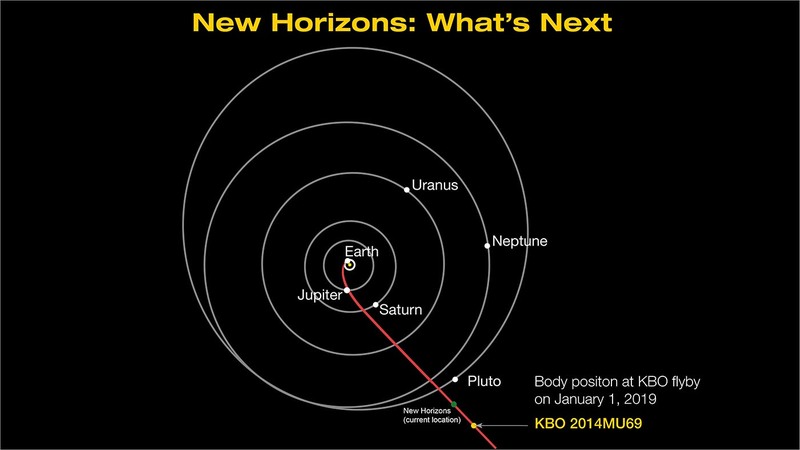 The red line marks the path of New Horizons toward its next flyby, a Kuiper Belt object known as 2014 MU69. The green dot approximates the spacecraft's current location.